This article Tom Etzel co-authored was published in Inside Philanthropy on July 10, 2018. We are two philanthropists who share a commitment to building a more peaceful world. We do this by making grants to organizations that focus on peace, violence prevention, and social inclusion. Recent articles in Inside Philanthropy and The Nation have explored why more funders don’t support peace and security work. And a 2017 Forbes list of $25 million-plus gifts for social challenges did not cite a single peace-oriented gift. We are proud of our support for peace efforts, but we realize that the peacebuilding field has a way to go before it can secure more significant amounts of funding. We believe that our experience as funders, specifically funders with a for-profit, private sector background, can be instructive. The foundation that Tom created on September 11, 2010, the Global Peace Building Foundation (GPBF), seeks to build peace by supporting organizations and projects that restore, rebuild and transform relationships that have been broken due to stereotyping, hatred and fear that have accumulated over generations. “Micro-grants” are made to select organizations in the range of $500. Milt orients his giving to the Purdue Peace Project, which reduces the likelihood of political violence and contributes to lasting peace in West Africa and Central America. He also funds research that stimulates the creation of new knowledge, information and data that can help donors make decisions about what to fund. Both of us prioritize actions and solutions driven by people within conflict-affected communities. And we have both observed positive impact resulting from our philanthropy. Tom’s philanthropic giving was motivated by the loss of both his niece and a close friend on September 11, 2001. For Milt, becoming a retiree created an opportunity to give back, specifically by reflecting on the ongoing war and conflict in the world and asking, “What can I do to reduce the terrible human and economic cost of armed conflict?” Though we came to our current peacebuilding / violence prevention philanthropy for different reasons, and we give at different levels, we draw on our private sector background to inform our giving. Increasingly, we’ve realized that this particular framework often sets us apart from other donors in the peacebuilding field. When the GPBF considers where to make its micro-grants, it closely sticks to the eligibility criteria it established early on: organizations focused on youth and children that employ an approach known as the contact theory. The contact theory holds that negative attitudes can be reduced by promoting contact and familiarity between conflicting groups. Once those criteria are met, the GPBF looks for organizations that have financial reporting systems in place and an ongoing plan for monitoring and evaluating the effectiveness of their programs. GPBF recognizes that quantitative data is often challenging for grantees to secure, so it looks for qualitative indicators that the attitudes and perceptions of the youth and children are changing in a positive way. When it comes to expectations around reporting, GPBF is flexible, but does expect the grantee reporting to get more sophisticated as their revenues grow and they are able to invest more resources in reporting systems. His approach about what to fund is based on his best judgement about the cost-effectiveness of the potential grantee work and the value of results to society. Milt’s firm belief in the importance of cost-effectiveness as a metric has led him to dedicate an area of his giving to the development of more cost-effectiveness research. Milt is currently funding several research projects on peacebuilding cost-effectiveness. Similar to the GPBF, Milt invests a good deal of time in getting to know potential grantees and building relationships with them. And although Milt doesn’t have a lot of formal grant requirements, performance against budget is a key factor. We know that businesses make spending decisions based on what gives the most bang for the buck. In the peacebuilding field, that gets much less attention; little has been done to determine where money and effort can do the most good. The unfortunate result is that donors and practitioners possess less than an ideal amount of evidence on which to base decisions about where to spend their effort. We’d like to see peacebuilding organizations focus on measurable results at a minimum cost, consider cost-effectiveness in their work, use data to make decisions, and adjust accordingly. Decades ago, there was a mentality of “us versus them” regarding the for-profit and not-for-profit sectors. Mindsets and values were perceived to be drastically different in each group, there was skepticism, and little room for collaboration. Thankfully, that has changed. Public/private partnerships are commonplace, corporate social responsibility is sophisticated and genuine, social impact investing is trending, and many more nonprofits are adopting a strategic and quantitative mindset to ensure the success of their mission. Let’s build on this to foster learning that can happen between the for-profit world and our particular, small slice of philanthropic giving: peacebuilding. We believe that this kind of openness and learning will increase the chances that (1) corporate philanthropists (and others) will recognize the potentially positive role they can play in building peace, and (2) they will step up to support peacebuilding efforts. We also think it’s time that companies who have been supporting education, poverty alleviation, and sustainability programs through their philanthropy take on peacebuilding as a new cause. Investing in peacebuilding initiatives is certainly the right thing to do, but making and preserving sustainable peace also provides opportunities for investment, for sales, and for developing sources of supply. Without peace, doing business is difficult, often impossible. And without sound financial management, focus on results, and cost-effectiveness, peacebuilding organizations will struggle to achieve their worthy goal. As we continue to support initiatives within the peacebuilding field, we’ll encourage the field to adopt a more rigorous approach to cost, effectiveness and return on investment. We think this is key to drawing in more funding for peace, which the field (and the world) desperately needs. Tom Etzel, based in Pittsburgh, is a Certified Public Accountant and Investment Advisor with four decades of experience. September 11, 2001, was the major catalyst in Tom Etzel's commitment to peacebuilding, propelling him to pursue a Master of Arts in International Relations from the Fletcher School of Law and Diplomacy (Tufts University) and to establish GPBF in 2010. Milt Lauenstein is a chemical engineer by training and has an MBA from the University of Chicago. Retired for approximately 20 years, he has served as CEO, president, or chairman of several successful corporations, as a director of over a dozen corporations, and as a management consultant. He co-founded the Purdue Peace Project in 2011 at his alma-mater, Purdue University, based on a test case of locally led peacebuilding that he had funded earlier. Both authors are members of the Peace and Security Funders Group. With much excitement, the Global Peacebuilding Foundation (GPBF) announces its newest grantee: Musicians without Borders (MwB). MwB will receive a $500 Precision Micro Grant℠ joining Dancing Classrooms Pittsburgh, PeacePlayers International, and Seeds of Peace in GPBF’s roster of grantees. Like the other grantees, MwB facilitates relationships across difference, helping young people overcome prejudice, stereotyping, hatred and fear. Founded in 1999, MwB focuses on the power of music to build peace, connect people, empower musicians as social activists, and train local youth as changemakers. This particular grant will support inter-ethnic workshops in the Mitrovica Rock School (Mitrovica, Kosovo). Mitrovica is Europe's most divided city, with Serbs and Albanians living on different sides of the River Ibar ever since the end of the war in 1999. An entire post-war generation has grown up isolated and divided from ‘the other’. Before the war, Mitrovica was a rock music city, a tradition of which both sides are still proud. The Mitrovica Rock School restores this rock music culture by providing a neutral platform for youth from both sides to meet as young musicians and aspiring rock stars. They provide daily lessons and band coaching sessions, all of which connect youth through weekly inter-ethnic workshops and its program for ethnically mixed bands. 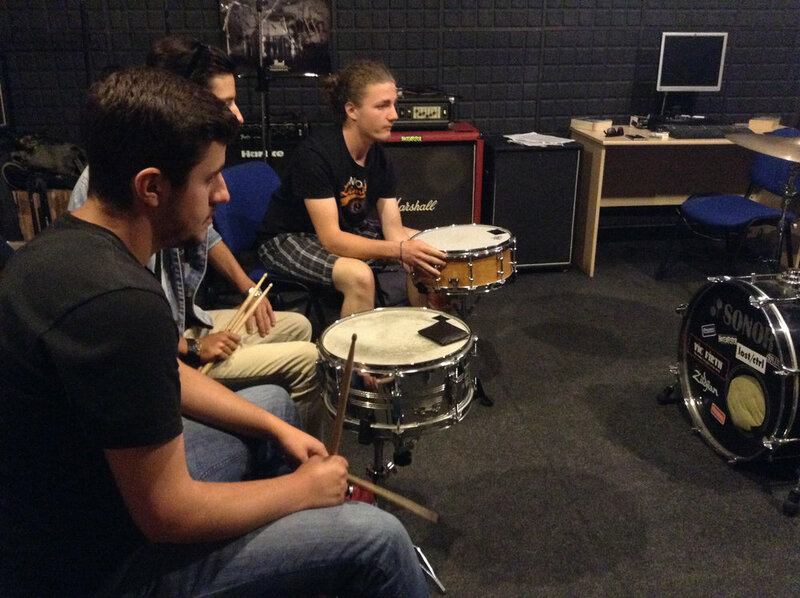 Over 900 youth have attended the Mitrovica Rock School since its launch in 2008. Working in communities over the long-term, MwB has observed that participants in their programs experience less fear of the other, increased willingness to engage across difference, an increase in freedom of movement, and increased empathy. MwB believes that “War divides. Music connects.” GPBF is proud to support MwB as they engage with the young people of Mitrovica to build peace and understanding. GPBF has been a proud member of the Peace and Security Funders Group (PSFG) since 2014. PSFG is a network of public, private and family foundations, and individual philanthropists who are committed to promoting international peace and global security. In April 2017, PSFG and Foundation Center launched the second annual Peace and Security Funding Index which details data and trends from 2014 about the 290 foundations that supported over 1,800 organizations with more than $357 million spread across nearly 2,800 grants. Peace and security funders are indeed making important contributions to global peace and stability, despite making up less than 1% of total foundation giving. The Index is a valuable resource and we are grateful for GPBF’s giving to be reflected in this data. To learn more, visit www.peaceandsecurityindex.org. PeacePlayers International (PPI), a Global Peace Building Foundation (GPBF) grantee, was recently selected a winner of the 2017 Robert Wood Johnson Foundation (RWJF) Sports Award. GPBF is proud to support PPI in their efforts to bridge divides through basketball. Given to just three organizations yearly, the $7,500 award recognizes honorees for their “innovative and influential approaches to using sports to improve the Culture of Health in their communities.” For more than 40 years, the RWJF has worked to improve health and health care. 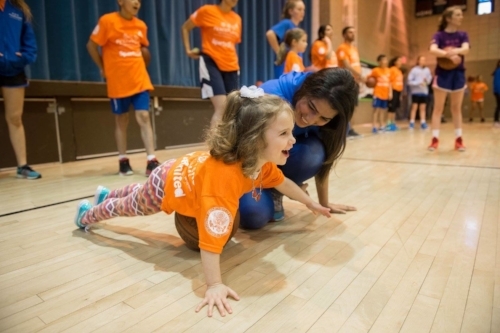 The Sports Award honors the efforts of PPI to build healthier communities through sport. The award will help PPI raise awareness as they partner with Nike to expand their programming in the United States (Brooklyn, Baltimore, Detroit), striving towards a world where youth who play together can learn to live together. We congratulate PPI on this honor and look forward to our continued collaboration. In December 2016, Global Peace Building Foundation distributed a Precision Micro-Grant℠ to PeacePlayers International - Northern Ireland (PPI-NI) in support of their programs in Northern Ireland. This is the 5th grant that GPBF has provided the global organization. Through sports, PPI-NI educates and unites young people in divided communities. PPI-NI’s programs are built on the belief that "children who play together can learn to live together." PPI-NI bridges divides, develops leaders, and changes perceptions in what continues to be a very segregated Northern Ireland. Recent political actions in Northern Ireland are dividing people and forcing them back into traditional trenches. However, the efforts by PPI-NI at the grassroots level to convene young people, facilitate opportunities for regular and sustained contact, start important community relations conversations, and provide training and capacity building are making a difference. Between September and December 2016, PPI-NI worked with 1,056 Catholic and Protestant youth. Since 2002, over 20,000 young people have participated in PPI-NI programs where sport is a unifier. PPI-NI is doing its part to build a generation of “Champions for Peace”, young leaders equipped with the experience and skills to have the conversations across divides and build relationships of trust. In providing this latest grant, GPBF recognizes PPI-NI’s serious commitment to undo the hatred, fears, and violence that has passed down from one generation to the next in Northern Ireland. We support their work to help thousands of young Catholics and Protestants use sport to challenge sectarianism, prejudice and racism, while developing new friendships. In December 2016, Global Peace Building Foundation (GPBF) distributed a Precision Micro-Grant℠ to Seeds of Peace (SOP) International Peace Camp in Maine. This is the 5th Precision Micro-Grant that GPBF has issued to SOP. The grant recognizes the Peace Camp’s commitment to undo the hatred, fear, and violence that is passed down from one generation to the next in different conflict settings. The International Peace Camp, a core SOP program, provides a safe space for teenagers and educators to come together across lines of conflict, in a traditional summer camp setting. Dialogue is central to the summer experience and creates an opportunity for participants to see the human face of those they may have previously viewed as ‘enemies’. Participants build relationships based on mutual trust and respect, perceptions and attitudes shift, and they gain insights into the root issues that divide them. SOP’s network now encompasses over 6,000 alumni throughout the Middle East, South Asia, Europe, and the United States who are uniquely positioned to lead change in their home countries. SOP programming helps young people build the skills and relationships they need to accelerate social, economic, and political changes essential for peace. Research demonstrates that SOP is having an impact. We honor their commitment to breaking the cycle of conflict and their contributions to building the sustainable peace that all youth and children deserve. In December 2016, Global Peace Building Foundation (GPBF) issued its 3rd Precision Micro Grant℠ to Dancing Classrooms Pittsburgh. Dancing Classrooms Pittsburgh is a program of the Pittsburgh Mercy Health System. Dancing Classrooms Pittsburgh offers a 10-week social development program for 5th and 8th graders, focusing on ballroom dancing as a vehicle to change the lives of children, "transforming lives one step at a time”. GPBF’s grant is in support of the "Colors of the Rainbow Spring Team Match", an exciting competition that showcases the skills of Dancing Classrooms students. Dancing Classrooms Pittsburgh builds positive social awareness, confidence, and self-esteem in children through social dance and curriculum-based teaching. The dancing helps break down social barriers between children, educates them on honor and respect, serves to improve self- confidence, and facilitates communication and cooperation. On the dance floor, children learn to accept and embrace difference. Pittsburgh Mercy Health System introduced Dancing Classrooms to Pittsburgh in 2009. To date, more than 3,300 children in Pittsburgh Public Schools, Catholic Diocese of Pittsburgh/Extra Mile Education Foundation elementary schools, Urban League Charter School and Environmental Charter School at Frick Park have benefitted from this program. GPBF honors Dancing Classrooms Pittsburgh for their work in creating a culture of peace and acceptance amongst our city’s children. Dancing Classrooms Pittsburgh is a program of the Pittsburgh Mercy Health System. With a 10-week, 20 session social development program for 5th and 8th graders, it utilizes ballroom dancing as a vehicle to change the lives of children. The tagline is "Transforming lives one step at a time." In Dancing Classrooms, the dance is a tool for getting the children to break down social barriers, learn about honor and respect, treat others carefully, improve self- confidence, communicate and cooperate, and accept others even if they are different. The Precision Micro Grant℠ issued by GPBF to Dancing Classrooms helped to support the "2016 Colors of the Rainbow Spring Team Match". GPBF is thoroughly pleased to be involved in supporting an organization devoted to building peace! GPBF recently distributed a Precision Micro-Grant℠ to SOP to help support their International Peace Camp in Maine. A significant goal of SOP is to enable dialog program participants to see the human face of their enemies, and from that experience build relationships based on mutual trust and respect. Since 1993, more than 6,000 graduates of the program, referred to as "Seeds," are becoming today's politicians, journalists, teachers, business leaders, community organizers, and above all, peacemakers. GPBF recognizes SOP's outstanding efforts to undo the hatred, fears, and violence that have been passed down from one generation to the next. We are grateful that SOP is working so diligently to break the cycle, and by doing so, contribute to the building of the sustainable peace all youth and children deserve. GPBF recently distributed a Precision Micro-Grant℠ to PPI to help support their programs in Northern Ireland and South Africa. PPI is a global organization that uses sports to unite and educate young people in divided communities. PPI operates under the premise of "children who play together can learn to live together." It is a great example that you destroy your enemies by making them your friends. Since 2001, PPI has successfully offered joint sports training, peace education and life skills activities to over 69,000 youth from 15 countries. GPBF recognizes PPI's outstanding efforts to undo the hatred, fears, and violence that have been passed down from one generation to the next. We are grateful that PPI is working so diligently to break the cycle, and by doing so, contribute to the building of the sustainable peace all youth and children deserve. September 11, 2001, was a tragic day for the entire world and for me personally. My 25-year-old niece, Katie McCloskey, was working on the 97th floor of the World Trade Center when American Airlines Flight 11 struck the North Tower. My high school friend, Ken Waldie, was aboard that jetliner. Both perished that morning. In the following days I began to consider how peace might be achieved if people could begin to see each other as human beings, as opposed to “the scary other” that was being broadcast on every major U.S. news station. Through my research and studies, I discovered the Contact Theory, a central tenet of peace building. Contact Theory was first developed in the 1950s by renowned researcher Gordon Allport, and is based on the belief that separation and unfamiliarity between conflicting groups can, and often does, breed negative attitudes such as stereotypes and prejudices which can potentially escalate into hostility and violence. Contact Theory posits that these negative attitudes can be reduced by promoting contact and familiarity between the conflicting groups. It emphasizes the development of personal relationships on a more intimate level. Contact Theory works best when it is applied to youth and children’s peace building programs. The change in attitudes and beliefs, which happens in the formative stage of a young person’s life, creates the conditions necessary for youth to form lasting relationships built on mutual trust and respect. Sustainable peace is rooted in relationships that maintain a sense of connectedness, trust, and the ability to communicate in a nonviolent manner. PPI is a global organization that uses sports to unite and educate young people in divided communities. PPI operates under the premise of “children who play together can learn to live together.” It is a great example that you destroy your enemies by making them your friends. In Northern Ireland, for example, PPI uses the game of basketball to unite, educate and inspire Catholic and Protestant young people. A formal peace accord between the Catholic and Protestants was signed in 1998, but tensions remain. The schools and neighborhoods are highly segregated. Less than seven percent of Northern Ireland’s pupils attend integrated schools. It will likely take many generations to erode these long-standing barriers so that Catholics and Protestants no longer view each other as the “other side.” Since 2001, PPI has successfully offered joint sports training, peace education, and life skills activities to over 65,000 youth from 12 countries. A significant goal of SOP is to enable their dialog program participants to see the human face of their enemies, and from that experience build relationships based on mutual trust and respect. SOP operates a camp in Otisfield, Maine that serves as its programming foundation. Israeli and Palestinian youth, for example, spend three and a half weeks together in intense dialog and recreational and team building activities. The experience is transformational. Since 1993, more than 5,000 graduates of the program, referred to as “Seeds,” are becoming today’s politicians, journalists, teachers, business leaders, community organizers, and above all, peacemakers. The process of peace building is complex. Attitudinal change is just one component in this process. It requires a long-term commitment with the realization that it may take many generations to undo the hatred, fears, and violence that have been passed down from one generation to the next. The aim of using Contact Theory is to break the cycle, and by doing so, contribute to the building of the sustainable peace all children deserve.